The month of October is different to the other months somehow. During this month we have seem to deem it as that annoying gap in between party season, holiday preparations (Xmas stuff is the supermarkets people!!!!) and in Australia the long deserving break we all need. Yes people will tell me “oh you have plenty of time to go out and meet someone” or “21? Girl you have forever to accomplish something”. A majority of the time I do believe them, being the “super positive” person that I am; none the less something reminded me that I have not had an kind of relationship for over two, three years. Hell so bad I cannot even remember the last time I thought of someone as potential date. The reason this is came up is because I recently played a song on my iphone that not only reminded me of my absent love life but also reconfirmed that yes, you will be alone forever. This why I do not like to keep sad, break up, Bridget jones’ diary songs on my computer; makes me think of my horrific love like. Like pandas I do not think about the issue of procreation over food and sleep; hey why do think I have food blog? This realisation really does a number on my mood, especially when you can “feel” your heart “breaking” or “bleeding” as the sad love songs put it. I wonder if any of you young people (sorry I do not know what to call my social group) or even the single ladies out there; how you deal with the feelings of panic over the lack of dating scene or love in your life? Now comforting foods is what I need right now. It is soon summer in Australia which means that I have to stock up on the ice cream. Yes the combination of end of year exams, social fails and simple gluttony means ice cream is one of the staples of the kitchen. I have only recently got myself an ice cream maker which does make it easier to churning up instant comfort. Yes I have eaten ice cream straight from the churning bowl, sue me. In an effort to at least make my life or my doctor a bit happier, I decide to try and make yoghurt based ice cream. I love yoghurt, if you could see my fridge I have at least 4x1kgs tubs of Greek in it. Every day I will at least use more than half in my eats, so seems only natural to try it out. Also it adds an ice tang to the ice cream, much like the sour cream trick I have seen. Now yes this recipe is made my frozen fruit. 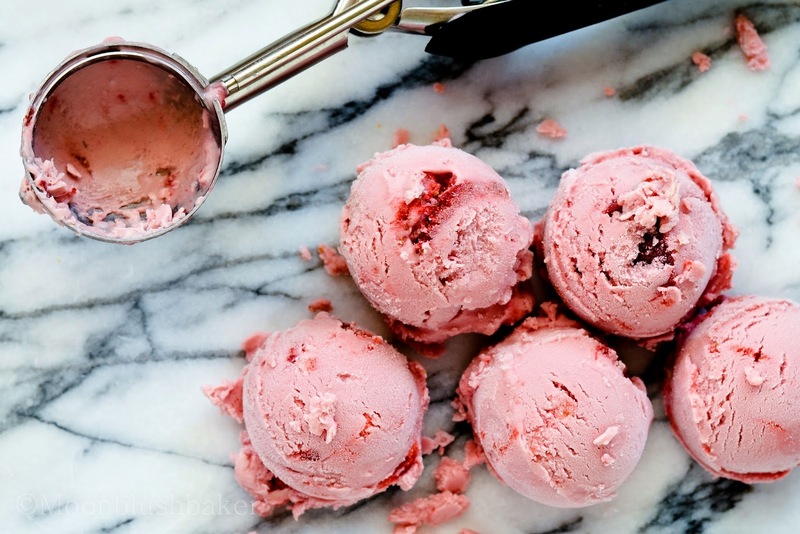 However do not be fooled by the “cheapness” of frozen food ; I find the berries you get frozen are better than the ones in the store (especially after hundreds of people have touched and felt them before you did) While my hypochondriac nature is being to show, I recommend you try making fruit ice cream yourself. At least you can try to justify it as healthy when you are depressed and down about love as I am. 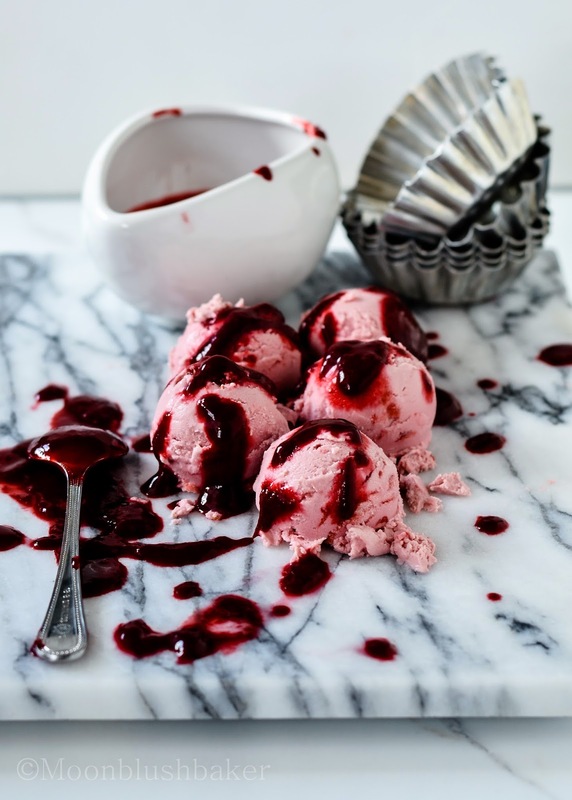 Oh be hold my red berry “bleeding” heart ice cream! The tartness of the mix of strawberries and cranberries means the raspberry coulis works wonderfully to high light the freshness of this dish. 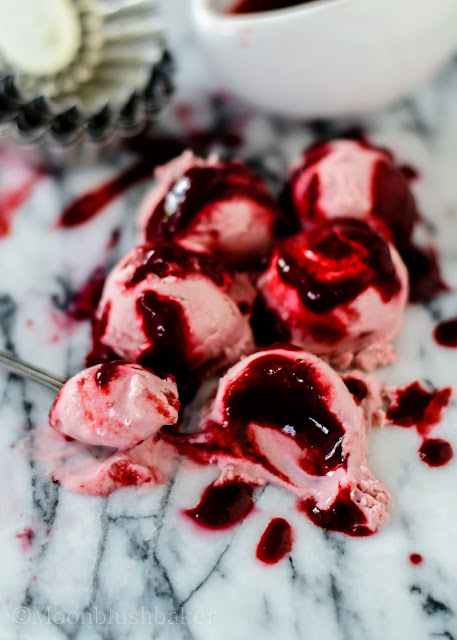 I am not trying to sell food as a good way of comforting yourself, but If you are like me and only experience this once a year; get yourself a spoon and sit with your churner filled with ice cream. For the sauce, in a medium sauce pan. Place your berries and sugar over medium heat. Cook these berries, pushing down on the as you go to create a rough puree. Allow to bubble for 10 minutes; reduce the original sauce by half. Strain to a glass bowl over a sieve and transfer to fridge. Make sure it cold before use. 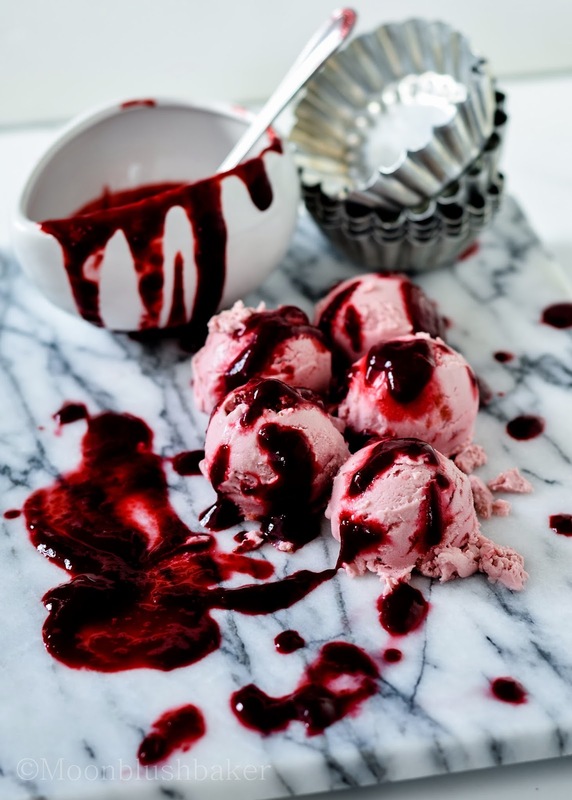 Churn to your ice cream makers instructions, in the last 2 minutes pour the rest of the sauce into the mixer. Fridge in air tight overnight before eating. Place your berries, water, sugar, and salt in medium sauce pan. Over medium heat, cook until the sauce is combined and melted together. Strain it through a fine sieve, being careful not to push too hard on the fruit, to avoid small seeds. Place back in the clean pot and add the Liquor. Reduce it by 1/3 and transfer to a container to fridge over night before use. 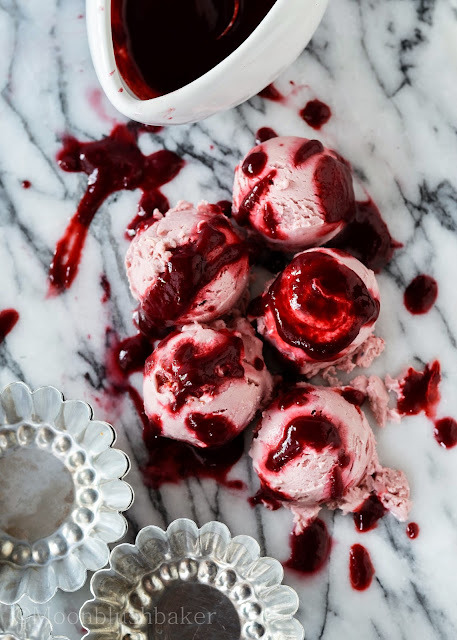 Not only does this ice cream look beautiful (beyond!) but I can only imagine how great it tastes! I like your faith in me, only if I could adopt that attitude. I love the colour too! 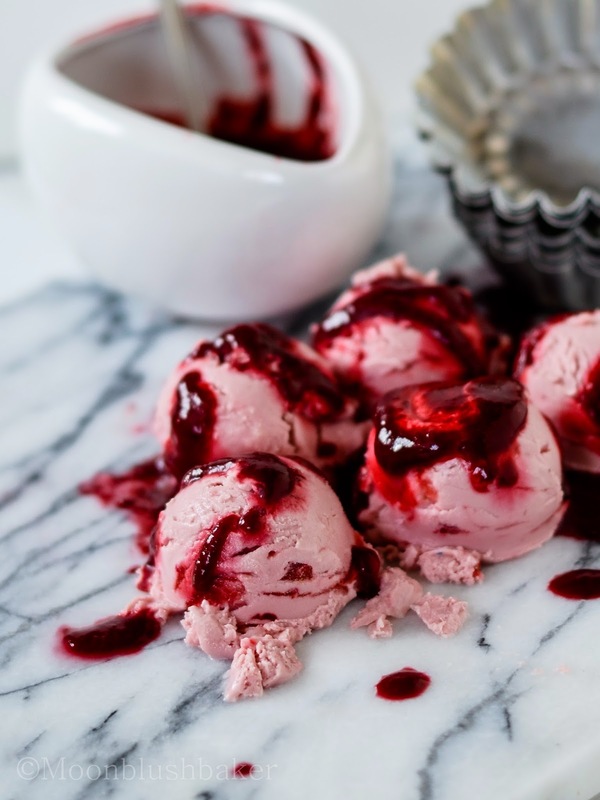 who knew frozen berries would look this good? I really hope you do make it, it is creamy and delicious! I love the crime scene-inspiration.. I never would have thought to style a shoot that way – genius! 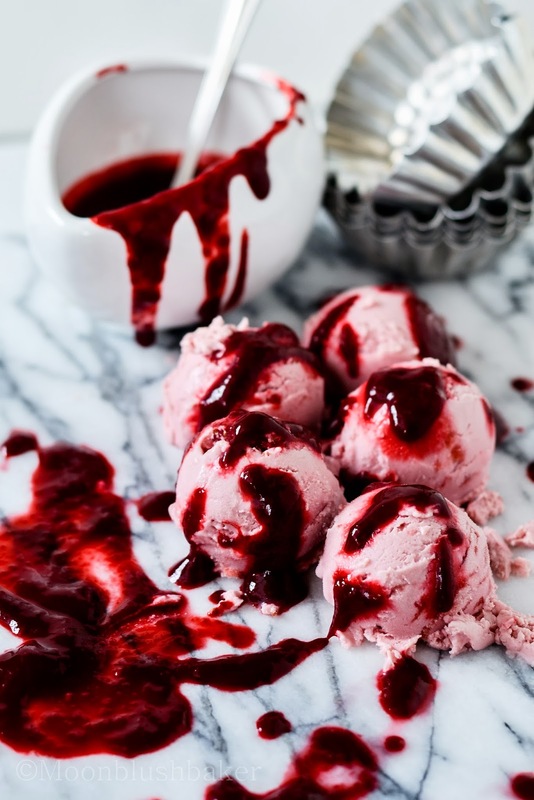 Raspberry coulis is just… just… ugh, I love it. I will be happy to, I hope you have great Halloween! May be you can take this and make it for your next party. Wow! I’m just in awe over how beautiful the photos are!! Pinning and you’ve found a new follower here!! I also blog over at http://fromgatetoplate.com and I would love for you to come visit. Look forward to seeing you there!! Thank you Lauren, it is always nice to have a new fan!